Winter is the absolute best time to get outdoors in South Florida. While the rest of the country shivers, we’re enjoying mild temperatures (highs around 70) and blissfully low humidity, at least as compared to the rest of the year. A cold snap is particularly welcome because it drives off or kills the blood-thirsty mosquitoes that populate most of our natural areas. We took advantage of the great weather over the MLK holiday weekend to travel to one of our nearby national preserves, Big Cypress. Like the Everglades, Big Cypress was affected by Hurricane Irma and only recently resumed normal operations. Specifically, the main land-based activity at Big Cypress, driving the gravel Loop Road, was unavailable before January 5 because of high water covering the roadway, resulting from massive water releases from Lake Okeechobee following the busy 2017 hurricane season. Our half-day trip took us to a new-to-us national site, where we were able to confirm that cypress trees are 100% the dominant species in the landscape. The open sawgrass plains are dotted with small cypress, while deeper areas feature dense growths of towering cypress trees that shade the waters below. 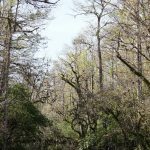 These cypress swamps support a complex community of other plants — especially the noticeable epiphytes that cling to the tree trunks — birds, and animals. Like most of the natural areas of Florida, Big Cypress is filled with alligators that languish along the side of the roadways. Birds were also abundant, but not posing in convenient locations for photography. So without further ado, here is a gallery of images from our quick trip to the appropriately-named Big Cypress preserve. Click on any image to make it full size — smiling gators abound. OK, just one more gator.